The MIC29510 and MIC29512 are high-current, high-accuracy, low-dropout voltage regulators featuring fast transient recovery from input voltage surges and output load current changes. These regulators use a PNP pass element that features Micrelâ€™s proprietary Super βeta PNP® process. The MIC29510/2 is available in two versions: the three pin fixed output MIC29510 and the five pin adjustable output voltage MIC29512. All versions are fully protected against overcurrent faults, reversed input polarity, reversed lead insertion, overtemperature operation, and positive and negative transient voltage spikes. A TTL compatible enable (EN) control pin supports external on/off control. If on/off control is not required, the device may be continuously enabled by connecting EN to IN. 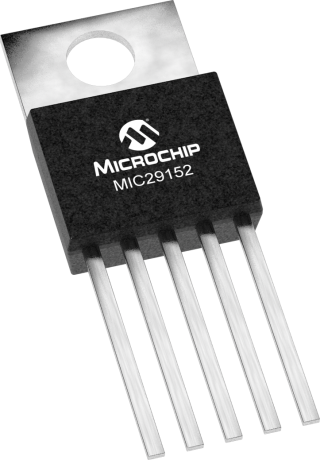 The MIC29510/2 is available in the standard three and five pin TO-220 package with an operating junction temperature range of 0°C to +125°C.